Crappy crappy crappy things happened this week in the U.K.
Of course crappy crappy crappy things happen every day in the world. It’s just we don’t have to pay attention to them too much unless we make an active choice to. And this week crappy was right in our face. For some of us, crappy was in our hometown, on our doorstep, people we actually knew. Bringing it all closer to home. Reminding us that all is not well for everyone. All may not be well for US one day. And yet we know, because we have been here before, that life will return to normal. We will shift our attention back to what is going on in our own lives and for those of us not directly affected, Manchester will become a spot of sadness, a sorrowful shaking of the head, a wish that things could change in this world. Before you go to that place, and lady, I know you want to get there as quickly as you can whilst still remaining respectful, stay here with us. Just for a little while. So we can check in on our Somebody Inside and then do the same for those around us. Stay. This is important. I saw a brilliant post on Monday about how these moments change us, perhaps without even realising. How? He talks about three categories, the ‘Extremes’, the ‘Grey’ people on either side, and the ‘Untouchables’. The Untouchables are the people who fundamentally believe that we share this world together, that love wins. They will not be swayed. They are not a target for opinion changing. No-one is trying to change their opinion. The Extremes. They want everything their way. Which means removing permanently, anyone who doesn’t. Unlikely you’re going to sway them either. The ‘Greys’ though, they’re a little more interesting. Because we know there are so many shades of grey. A terrorist attack can make them a little darker or a little lighter depending on the choices they make. This week, people who were previously on the fence about immigration, may suddenly shift their vote because they believe this has become a key issue. People who believed they pretty much loved everyone in the world might, in their fear and anger, start altering their language and calling people vermin, or evil and other people might not be sure whether they include them in that conversation. People who believed they were safe in this, their home country, might be attacked in the streets by the real extreme guys and previously, when another grey would have rushed into help, now they might bow their head and walk by, less sure, or believing that it’s kind of understandable. People who used to be friends might now not quite be able to talk to each other in the same way. Because maybe we’re not the same after all. And as the shades of grey shift, more people move a little closer to the extremes. The dynamic changes. The Extremes get a little closer to their dream, which on both sides (be very clear about this, both sides) is all out war, annihilation, removal of those who pose a threat. Let’s be clear, I’m not saying anyone of us is about to become a terrorist, I am saying that our choices and behaviours over the next few weeks have the potential to create knock on effects that we would never have consciously chosen. Most of us want to get on with our lives in peace. We want to stay Untouchable. Except, if you do already fall into that category, let’s not even get all floaty and yay me about that, because I need to say, even before this event, I recently realised I am a WOEFULLY INADEQUATE untouchable. I am so poorly equipped to do the right thing, it is terrifying. Even writing this makes me edgy as I try to craft words that will speak without damaging. 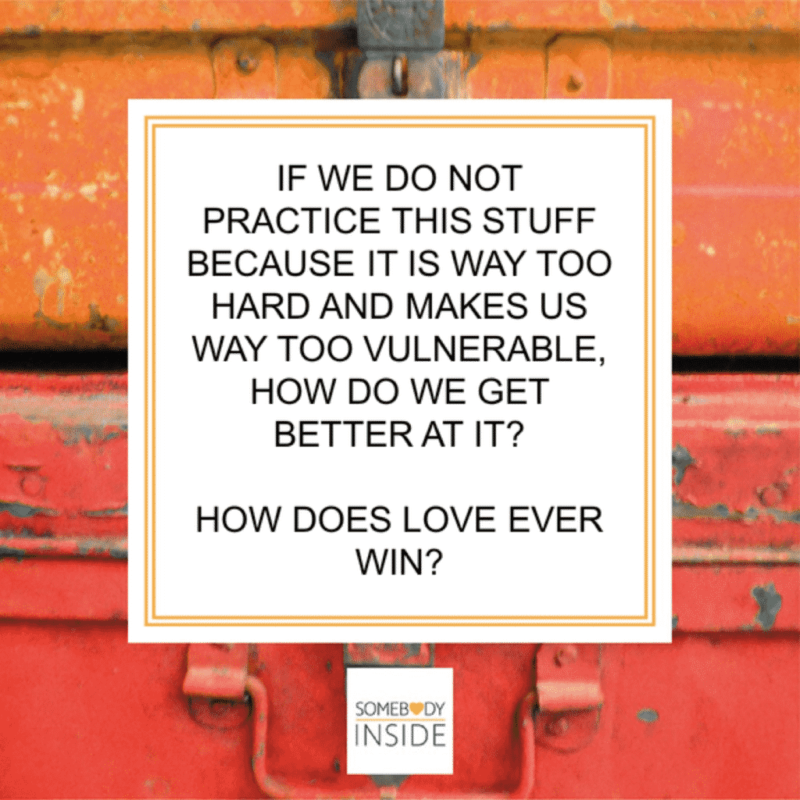 IF WE DO NOT PRACTICE THIS STUFF BECAUSE IT IS WAY TOO HARD AND MAKES US WAY TOO VULNERABLE, HOW DO WE GET BETTER AT IT? HOW DO WE TURN THE TIDE? I’ve got two illustrations for you. She’s hurting and angry. Because of her race, she is putting out messages that say ‘not in my name’ and no-one is backing her. She’s getting one or two likes, maybe a heart every now and then and no comments. She even posts, “should I be thinking about ‘going home too?’ “. Because we’ve turned a little greyer? Or because we don’t know what to say? Or because we don’t want a shower of comments on us? Better to stay out of it. WE HAVE TO PRACTICE REACHING OUT, EVEN IF WE MESS IT UP. Because we don’t want ANYONE turning a little greyer after Manchester. Or any other event. And because we LOVE her. We loved her yesterday. She was our friend. She IS our friend. She needs to know it. I’m getting clearer and clearer that I have a bunch of biases that I wish I didn’t. I want to change that. Oprah Magazine pulled their punchiest issue out of the bag this month, ‘What do you see when you look at me? Real talk about race’. I read it with interest. When Black Lives Matter rose up last year, I began to realise, in my white well off privileged position that even though I would HATE to consider myself racist, I had work to do. At the very least, in the understanding of what it feels like to NOT be what I am. I had no idea. In the magazine, we are asked to fill the blank in on 9 questions. BOOM. My answers? Good grief. And yes, I can justify them all with where I live, the fact I don’t watch much telly, but the truth is, only ONE person of a different race has been in my flat. And she might be reading this going, ‘she can’t mean me, I was only there for about ten minutes’. Of the 349 books (yep) that are on my Kindle (so I have NO excuse here), I count TWENTY THREE that represent a race that is not my own. OF COURSE MY PERSPECTIVE IS OFF. OF COURSE I HAVE NO IDEA HOW TO SAY THE RIGHT THING. OF COURSE I CAN DO BETTER. What do we do now then? Oh lady, I wish I had all the answers. Believe me, not so much. You can be an Active Representative of Love. You can watch that your colours are not changing. You can smile at people on the street. You can be the one who sits next to the guy on the bus. You can reach out to people on Facebook and hug them virtually, ask them if they’re ok.
You can start the conversation as to what it feels like to be a peaceful Muslim in Britain right now. You can notice that even though there are a hell of a lot of Extremes who are white in this country, no-one makes your life hard just in case you are one of them. No one tells you to ‘go home’ even though you’ve lived here all your life. You can stop lighting the grey fires with angry comments and breathe and practice a different way to respond. You can be consciously awake to what is going on around you and make choices from there. Now that you know all of this, you can TRY SOMETHING NEW. And you can keep trying, even if it goes a bit wrong. And this is where I get controversial. Love has to win friends. Do you think that boy would have strapped a bomb to his chest and blown himself up if he had felt LOVED? Are you really kidding yourself that he wasn’t shaking and terrified when he made this thing happen? Do you really think he could have been brainwashed if he knew he BELONGED in the world? And I know, some people have illnesses that make them do things. Who knows if that’s the story here. And still, MORE LOVE, MORE LOVE, MORE LOVE. We have to get better at this stuff. And we have always been able to do hard things my friends, always. Forgive me for practicing with you. I too had to start somewhere. Read more about Untouchables Error! Hyperlink reference not valid.. And practice finding the diamonds rather than being ignited by the comments. We have to get better at THAT too.